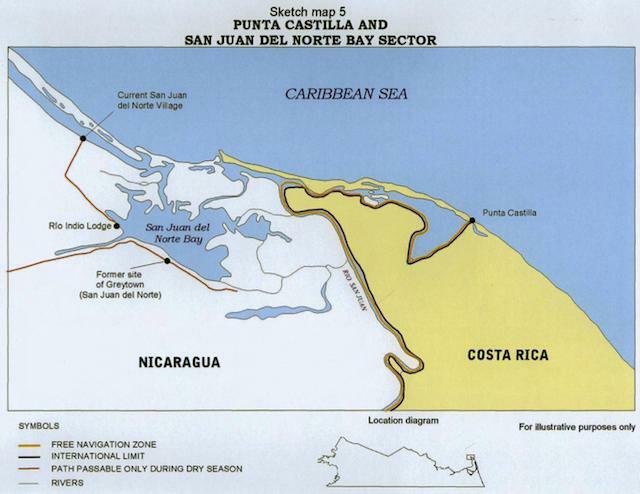 The eastern third of the border between Nicaragua and Costa Rica is determined by the course of the Río San Juan as it wends its way eastward towards the Caribbean Sea. In the final 20-odd kilometers, the river splits into two, with the border following the smaller, northernmost strand. (The southern strand is considered to be a different river, the Río Colorado.) 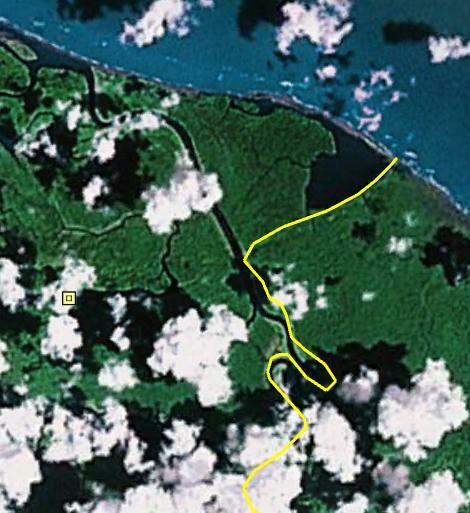 These two rivers delineate the delta island Isla Calero, Costa Rica’s largest. The mutual border was determined by the Cañas-Jerez Treaty of Limits in 1858, after a series of military escapades between the two countries motivated in part by the Rio San Juan being a candidate for a trans-isthmus canal. According to the terms of the treaty, the south bank of the river is Costa Rican territory but the river itself is Nicaraguan. Costa Rica has the right to use the river for commerce. The dispute flared up again this century, with Costa Rica in 2005 complaining to the International Court of Justice that Nicaragua was unfairly restricting access to the river. The Court’s ruling, delivered in 2009, was Solomonic: It ruled that Costa Rica cannot resupply its armed police border posts by river, but also that Nicaragua cannot demand visas from Costa Rican tourists traveling along the river. Nevertheless, during the second half of October 2010, Nicaraguan troops set up camp on Isla Calero, on the Costa Rican bank of the San Juan river just a few kilometers from where it reaches the Caribbean, raised the Nicaraguan flag, and then began tree clearing and dredging operations which are still ongoing. Their aim, so it seems, is to clear a channel that reflects what Nicaragua believes might have been the course of the river back in the 1850s. Ortega said the Costa Rica border has been steadily encroaching northward for hundreds of years, as the San Juan River delta slowly dries out. However, he said, even though the historic river mouth has dried, it is still Nicaraguan territory. Ortega stressed that according to the July 2009 resolution from the International Court of Justice at The Hague, Nicaragua has the right to recuperate the historic delta of the San Juan River that existed more than 150 years ago. “Nicaragua has the right to dredge the San Juan River to recover the flow of waters that existed in 1858, even if that affects the flow of water of other current recipients, such as the Colorado River,” Ortega said, reading from last year’s resolution for The Hague. 153. Nicaragua adds a further submission. It requests the Court “to make a formal declaration on the issues raised by Nicaragua in Section II of Chapter VII of her Counter-Memorial, [and] in Section I, Chapter VI of her Rejoinder”. 155. As for the fifth point to be addressed in the requested “declaration”, on the assumption that it is in the nature of a counter-claim, Costa Rica has cast doubt on its admissibility, arguing that it is not “directly connected” with the subject-matter of Costa Rica’s claim, within the meaning of Article 80 of the Rules of Court. The same issue could arise in respect of the third point. As Nicaragua has offered no explanation why the Award does not suffice to make clear the Parties’ rights and obligations in respect of these matters, its claim in this regard must be rejected. Clearly, the Court rejected Nicaragua’s request to add its proposed text to the ruling. But it is also now clear that Nicaragua has chosen to interpret the Court’s reaffirmation of the Cleveland Award as a legal go-ahead to clear and dredge those channels it claims were commercial waterways in 1858, even if these subsequently silted up as the course of the San Juan river shifted over the past 150 years. Where does Google Maps figure in all this? Opportunistically, it turns out. As long ago as October 22, 2010, Edén Pastora, the nationally famous Sandinista ex-revolutionary and now Nicaragua’s director of dredging on the Río San Juan, was arguing patriotically (translation) that the region is a no man’s land because the San Juan has changed course since the 19th century, when the Cleveland Award determined the border. By November 2, 2010, he had discovered that Google Maps’s border gives Nicaragua the top part of Isla Calero, and subsequently used this to justify the troop encampment on the island (translation). This prompted Costa Rica’s foreign ministry to contact Google, which in turn scrambled to check with the source of its data (the US State Department). Google has now said that the current Google Maps border for the area is wrong and that it will be updated as soon as possible. A couple of loose threads remain. First, Bing Maps doesn’t come off nearly as well as Search Engine Land’s post would have you believe. 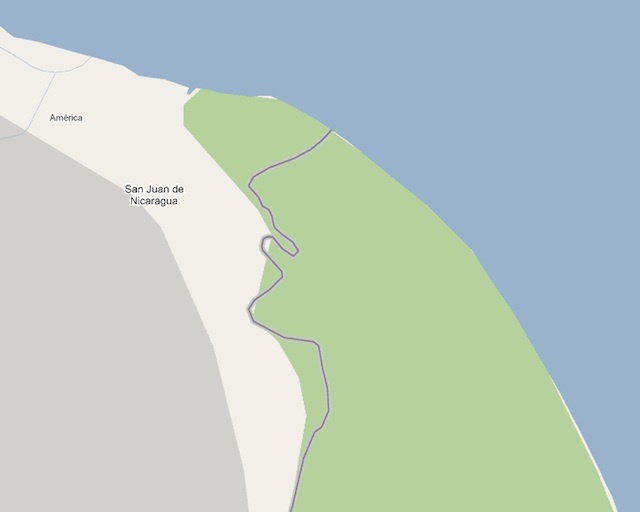 A cursory glance shows that Bing’s border does not accurately follow the course of Río San Juan. For a good 10km stretch, Bing actually gives Nicaragua both banks of the river, but at the same time grants several coastal islands to Costa Rica. This is because the dataset is not detailed enough to withstand a close-up. The US State Department’s admittedly faulty border, as depicted in Google Maps, is more of a puzzle. 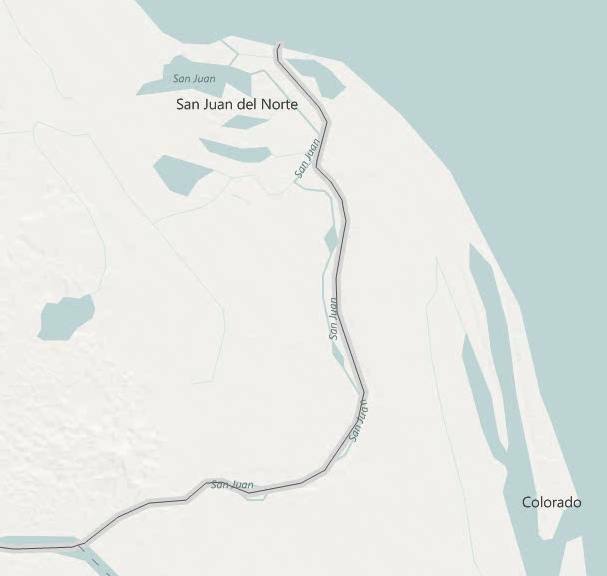 I first thought it might indeed have been an old dataset from the 1850s or 1880s, showing the course of the Río San Juan back then (as Pastora would have us believe), but I now think the dataset has to be modern but corrupted. That’s because Google’s border shows the distinct S bend in the river’s final few kilometers — an S bend which did not exist when E.P. Alexander drew his survey maps in 1897. Finally, a Costa Rican TV program on the issue (part 1, part 2) shows Nicaragua’s new claim line, but this line matches neither Google Maps’s border nor the border as surveyed by Alexander. 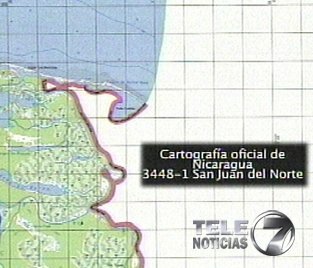 Screen grab from TV show showing where Nicaragua purports Alexander mapped the course of the Río San Juan. The screencap also shows the position of the dredger (bottom). 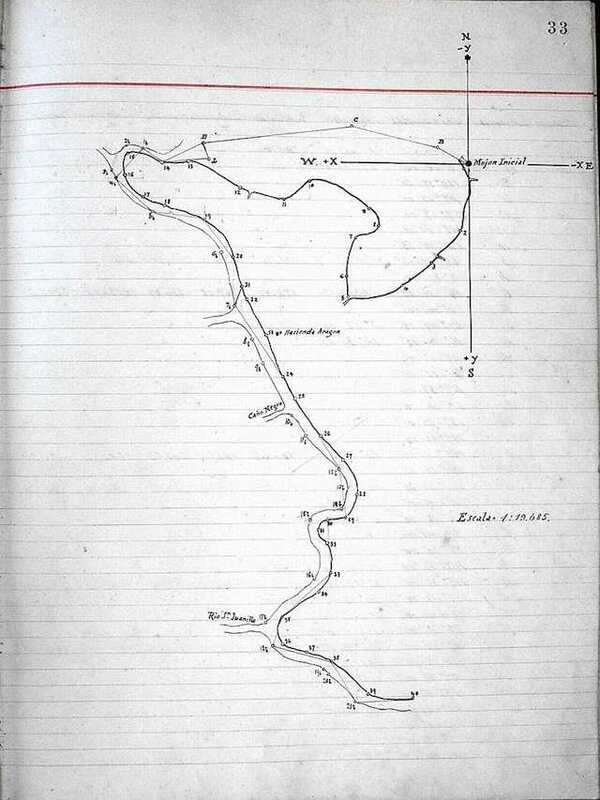 Below, how Alexander actually drew the course of the river (via Google Lat-Long Blog). 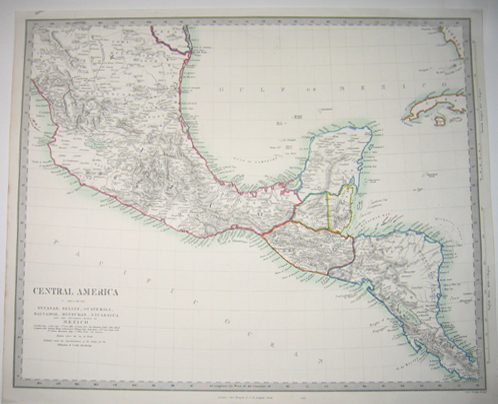 What Nicaragua has yet to produce is an antique map showing the course of the Río San Juan in the 1800s along the route it now claims as the new border. Even if it does, convincing the ICJ of this claim line’s legitimacy will be a tall order, considering how both countries have for well over a century mapped their mutual border according to the shifting banks of the Río San Juan. Nicaragua’s plan to artificially change the course of the river — and thus the border — by dredging and clearing gets points for originality. I just don’t think it will fly with anyone who is not already a Nicaraguan nationalist. Hi. My question / comment is this. 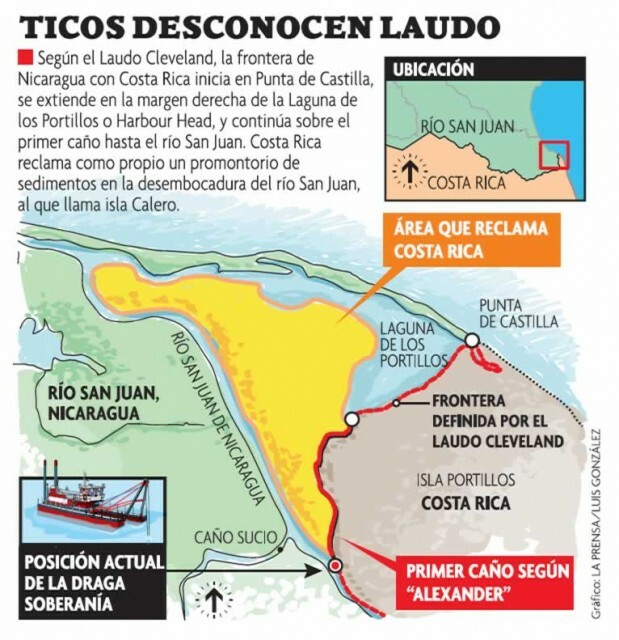 Alexander seems to have awarded Costa Rica that northern part of what today is known as Isla Calero, including the “Taura” branch of the Río San Juan that crossed the island back in the 19th century (see the Alexander Award Sketch). According to that award, no artificially changed course of the Río San Juan today would suffice to modify the boundary line set by Alexander in 1897 (not to mention the deployment of troops on the ground) as even with the Taura Branch it was part of the Costa Rican soil. That’s why I think Nicaragua doesn’t have a case here. Victor, I think the available evidence supports your conclusion. Nicaragua would have to produce at a minimum some kind of document which charts the ancient course of the river along its new claim line. It doesn’t seem like there has been much of a change to the river’s course since Alexander’s days, so Nicaragua would need to use older maps, if they are available. And then Nicaragua would have to convince the ICJ and world opinion that its plan to reclaim the land by dredging and clearing is somehow a reasonable course of action. USA & Mexico, divides lakes and rivers down the middle. It’s not without problems, ie. the recent couple that wandered onto the Mexican Side: the husband was killed. But, at least the line is fairly well kept. I think to solve this problem the River must not belong to either country. It should be neutral territory, where neither side can alter, by dredging, or changing the course of the river by other means, unforseen, currently. I pray for Costa Ricans, who justly feel violated. Daniel Ortega, needs to vacate the Island Territories, claimed by Costa Rica, immediately. USA should enforce this, notion. If Ortega got it into his head, that he can’t push Costa Rica around, he will be shamed facedly sent back to Nicaragua, w/o accomplishing, his intended deceptions. I’m Costa Rican, and we are not saying that the San Juan River is ours, or anything like that. We are completely aware that it is nicaraguan and we’re not trying to change that. This is not the problem we have. They can do what they want in their side of the river, but not in ours. Just wanted to clarify this. Thank you for your prayers. To the autor, thank you so much for this investigation. Im a costarrican, and an HP employee, I’ve felt dissapointed about our deep democratic and peaceful roots. How can a small country, peacelover endure as it is with a threat like this? The values in which our nation has believed all this time, has betrayed us? The idea of peace with the whole world and human development has gone so quickly? Maybe Bush was right.. maybe we are just dreamers..
sorry about this complete lost of hope.. This is the best summary I’ve read so far on the actual cartographics surrounding the dispute. Thank you, Stefan, for cutting through the rhetoric. With all of the ‘whoops, Google Maps!’ static across the Internet this weekend, I’m glad someone has taken the time to really research it and debunk it. Thank you for these valuable information. I’m always impress by your thorough contextualization of current world event. Hi every body, this is an emergency call to mantain pace in all latinoamerican area. 1- Above 1 yr ago Hugo Chaves(Venezuela’s “president”) bougth a giant amount of military equipment(Subs, boats, war planes, arms every king etc) many many millions of dollars, my question is Why?, the only think he has in his mind is to got cideological control of all latinoamerica to opposite US. 2- Daniel Ortega has became his rigth hand in Central America and he is following Hugos’s same steps. His going for his thrith term against the law, (that of course, the Court of Justice and the Congress, he seted acoording to his will). 3- He has invaded the most vulnerable contrie there is in the area, he is not an stupido, he is smart, he knows, attacking Costa Rica will bring inestability to the region militarie speaking(of course he has Hugos’s favor) and that is what Hugo wants. 4- Hugo has meet with primer Minister of Iran to get together in a interocianic canal i Rio San JUan, guess what, El ALBA is financing the dregging of San Juan River, the draggers are Russian make and you know that they have 2 problems there 1-they need to cut the riv ers bet just in front of Finca Aragon the island narrowed section rigth by the middle, because aroud the “S” make by the river arout isla Calero there is sand banks built up naturaly since there are historical notion(Read Laudo Cleaveland and Laudo Alexander where this detail has been called out).. and yet the map draw by in Cleavelan’s an Alexanders’s awards shows Isla Calero in Costa Rica’s side. No dout about it. 4- In his speech 11/13/2010, Ortega(“Nicaragua’s President attacks all contries goberments from Mexico to Colombia even the AEO) of beiging manipuleted by the Narcotrafficants, opening an option to destabished the entire region. My question is, is this the start of regional conflit busted by Hugo Chaves, if so, all Nicaraguans and costarricas and all latinomaericans must act, not with violence but with prudence and paying no attetion to what ever these two neo communists wants. Let’s be carefull and stop attacking each other with insults let’s not play there game of war and conquest. What I wonder is which document from the 19th century motivates Nicaraguan government officials to make the claim that the land didn’t exist then. There is no reference at all to a document, map, etc. that supports that view. In my opinion, this is just some story they made up on the way. It is as valid as if we, Costa Ricans, said that the river took part of our land. The map by Alexander is very clear, I doubt that from the date of Cañaz Jerez treaty and 1897 the land would have changed so much that Alexander didn’t realize that this part of the land didn’t exist then. This is a very complex case, that given the circumstances and to avoid further conflict, both countries should agree to bilateral conversation and if needed, have the ICJ provide an imparcial interpretation. Both countries present reasonable documentation that may be closer to the signed treaties and as such, one of them is correct. It may not be the one yelling the loudest about it being violated. It may also be not the one with military personnel trying to defend, in their opinion, their motherland. 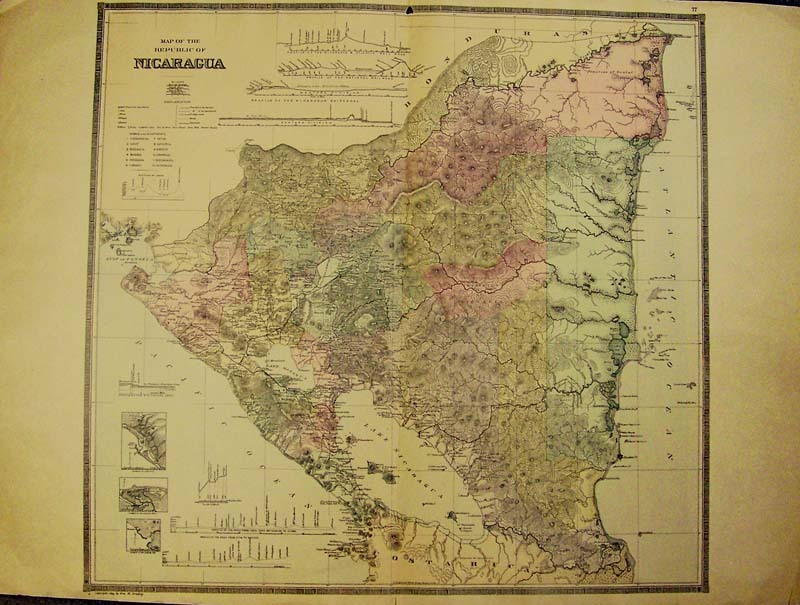 We in the Costa Rican side could agree that if Nicaragua has a claim of an error in the mapping “discovered” after more than 100 years of regular official studies it should be revised and conversed in a rational and ordered way. What we don’t like is the way in which they took posession of the land, destroyed the forest trying to make a channel and then, when discovered, try to blame Google Maps, shut down their official mapping site, recall the re-interpretation of an more than 100 years solved treaty and THEN call to conversation. Ours is the blame to not check thoughtfully what they where doing in that remote zone but now what we want is that they stop the making of the channel and vacate the taken land before starting any conversations. What they are doing is akind of your neighbor putting down your fence while your out your house, setting a shed or fountain in your garden and when you arrive come out saying “i think part of your land is mine, could we talk?”. It appear to me that the order is wrong. Coming in force, setting a flag and saying “this land is mine” is a really old way of doing things. Nicaragua, very conveniently, has very bad Spanish translations of Alexander Awards in websites (cf. http://www.manfut.org). It could be worse, Costa Rica does not show any. However, Nicaragua systematically hides the sketch map that General and Engineer Alexander raised. Stefans, you are the first analyzer to explicitly show us the Alexander´s map. As a matter of fact, the English text of the First Award is extremely clear. Spanish versions of Cleveland and Alexander Awards are a disaster. Since Nicaragua accepts Alexander’s Awards, and since the alleged “water arm or channel” of the San Juan river is not regularly flowing (see Award 3), the case seems absolutely winnable for Costa Rica. I just worry about the ecological disaster this “never-judged daughter-in-law raper” is promoting. It seems to me as if Ortega wants to have an interest on a hotel over the part invaded. Can anyone provide a link where users can report the incorrect borderlines to the Geo Policy Team? There is no way to send them a message. I would be happy if anyone of you could ask them to revise the hungarian-romanian border, because that is really crappy for months, however that is a really stable borderline for decades. Why do Nicaraguan what Calero Island? Costa Rica has preserved the natural habitat of the island. Nicaragua’s army has been several weeks on the island and has destroyed a lot of trees and nature. For that they want the island? One thing worth highlighting is that the area claimed by Nicaragua is actually protected wetlands, part of Costa Rica’s Refugio Nacional Barra del Colorado. The green color shown in Google Maps is the boundary of that national park. By taking this dispute to the ICJ, Nicaragua would have more than enough time to completely clear the area of vegetation (as they have already begun doing) and cut a canal to sea in order to reinforce their misguided claim. That is why the withdrawal of troops from the area and the cease of dredging operations (at least in the disputed area) is imperative and must be a necessary precondition for talks to begin, and why this dispute is more aptly resolved by the permanent council of the OAS or, if the OAS fails, the UN security council. For contemporay historians the Island is known as Canas! For historical facts is Harbour Head. This area was under British control until the Americans had put their eyes in Nicaragua during the gold rush in California. The owner of this passage was Cornelius Vanderbilt (indeed) at the time the richest man in earth. When the suscription of the “Jerez -Canas” the site border was south of the “Harbour Head” island. Also, for statistics Nicaragua has the largest untouch rain forrest of Central America, more than 60% of the rain forest in Central America resides in Nicaragua. For those who believes that Costa Rica is the so called “eco” friendly country are mistaken. Just take a trip and you will find out. Take a trip to Nicaragua and most likely you will not be able to find a way to get to this dense forrest! What an interesting fact about the Rain Forest in Nicaragua! Perhaps this could be a principle of the transformation of this conflict, to make sure that both countries integrate biological corridors across the border to preserve the habitats and wildlife of the region. It is a truly precious and unique ecosystem that both countries share. Some of the best preserved wetland left in the world. In China, for example, many wetlands along the country’s east coast have been converted into urban development, ports that extend for kilometers along where some of the most ancient wetlands in our planet used to exist. They don’t exist anymore. Both countries could gain international notoriety and recognition of the area in dispute if it became the most famous delta in the world. One of the most beautiful ones it already is. Building the capacity for both nations to sustainably develop the area for eco-tourism and biodiversity research is the correct thing to do. I think a harbor is a body of water and an island is a mass of land. If that were so, Harbor Head belongs to Nicaragua, and Isla Calero belongs to Costa Rica, which is what the historical evidence -and your comment- tend to confirm. Could you please explain what you mean by “contemporary historians?” It could be that they know something that should be heard as well. If it belongs into Nicaraguan official history textbooks, then there has to be a date of origin, and hopefully a map that supports the claim. One truth in this matter is that one would not exist without the other. Under such symbiosis, demarcating the land would not enrich the area. It would only corrupt it from its pure and natural state. For Costa Rica, historically Isla Calero belongs to Barra del Colorado Wildlife Refuge (Reference to Costa Rican government’s official website on the area: http://www.acto.go.cr/bacolwildrefuge.html). The fact that it is a wildlife refuge implies that it is the legally assigned use of the land by the decision-makers who ruled it so since 1985. More than 25% of Costa Rica’s territory is protected under some sort of conservation legislation, and that percentage is the highest in the world. Therefore our reputation as conservationists. If you appreciate environmental topics, I invite you to follow me on Twitter (@alvarcidane), as it is one of my areas of interest. If you are Nicaraguan, I hold you and your people very close to my heart. I am Central American too. Vandervilt used to have his base in Punta Castilla(given to Costa Rica in Canas-Jerez and accepted in Laudo Cleavelan), and according to historians from that time. Harbor Head was’nt that island’s name, it was what it’s, the name of the harbor(body of water-Laguna)in from of actual Isla Calero. If you read Laudo Cleveland honestly, you can find in it, the sedemen and erosion problrms has been an importan issue in this review, and in base of all the facts Laudo Cleaveland award wasn’t waht Costa Rica and Nicaragua claim, it went rigth on the middle and Isla Calero appears on that map the same as in Alexander’s map, no dout to who belong Isla Calero to add more, When Costa Rica claim to Nicaragua in ICJ it was’nt to claim any soberanity over the Rio San Juan(100% of costarricans are fully aknowlegeable of the soberanity of Nicaragua over the Rio San Juan), it was to claim the rigth to navigate the river for costarricans free of any charge or visa, etc. fully awqrded to Costa Rica and to reafirm the soberanity of Nicaragua over The Rio San Juan, Costa Rica took its maps same as Nicaragua and guess wath, both maps agree, 15 months ago, today Nicaragua shows a diferent map. A very serious and well grounded approach, much appreciated. Whatever the outcome of this issue shall be, appealing to facts that could be eventually proven before a legitimate tribunal will contribute towards the transformation of the conflict, especially if the Rule of Law prevails. It is desirable that the outcome may be achieved sooner rather than later, because it is in no party’s interest to prolong the dispute. If we aspire to development, both sides of the border should make joint efforts to achieve notoriety for the right reasons. Costa Rica already shares a National Park across an international border. It is called Parque Nacional La Amistad (“Friendship National Park”) and it lies across borders between Costa Rica and Panama. You cannot choose your neighbors, but you can choose how to relate to them. It is in the best interest of both societies that this issue is settled in a civilized manner. That means, by way of honor and justice, and by way of virtue and harmony. I believe it is possible to coexist mutually in synergy, Costa Rica and Nicaragua and all their citizens living on either side of the border. It is up to us and nobody else to govern that relationship. Perhaps Isla Calero, historically Costa Rica’s largest island (as learned in every elementary school), and Harbor Head, which Costa Ricans have always acknowledged as Nicaraguan territory, should belong to a common National Park across borders. It is already a natural sanctuary, and neither the birds nor the fish wonder on which side of the border they are. If we do not preserve the area co-jointly, making efforts to enrich the surrounding ecosystem together, neither one nor the other will survive if the other chooses to degrade the natural habitat. A port or an interoceanic channel anywhere within 10 km. of the region would alter its ecosystem perhaps permanently, and could eventually disappear. A few machines can turn Isla Calero-Harbor Head into human-made infrastructure in a matter of weeks. Therefore, the most important and urgent issue is to immediately ensure that the controversy both countries are engaged in, does not threaten the most sensitive value at stake, which is biodiversity itself, including all forms of life. If, beyond the environmental issues, there has been a clear violation of international law and one of the parties identifies a possible source of mistake, then an apology would be the shortest path to reconciliation. It is indeed a very peculiar geography in the area. Difficult to imagine another river delta between two countries, where the river itself belongs to the territory of only one of them, that has such a peculiar dividing line. In fact, there are very few cases in which a river dividing two countries belongs to only one of them. As an ecological concious person I understand your efforts to rationalize the conflict appealing to a political understanding to end this unfortunate conflict. The real objective of the governmet of Nicaragua, nonetheless, following an expressed order of the oil rich government of Venezuela, in association with the Castro brothers and the alliance of iranian president Ahmajinejad is to make of the San Juan River, a very restricted wet canal that will unify the Pacific to the caribbean. This lunatic foursome are seriously thinking in counteracting the world order and the Nicaragua Canal will suit their purpose. Something that has not been considered in this discussion is the fact that 2011 is an election year in Nicaragua. By Constitutional Law Ortega would not qualify to run for the presidency any more, because he has already served two terms, and that is the limit. However, he recently manipulated the National Assembly and the Supreme Court of Justice to illegally pronounce him qualified candidate. The boundary conflict is considered by many an ad hoc maneuver to divert public attention from his manipulations of the electoral rules and at the same time attract the sympathy of the voters by representing himself as a nationalist lieder devoted to the defense of the Nicaraguan sovereignty. Most likely, neither the river, nor the dredging, nor the ecosystem, not even the boundaries are of any concern in this issue. You are, unfortunately, very right. From the start, it has been evident that this is outright bullying on Ortega’s part. It’s a distraction maneuver and it’s working. This issue has successfully rallied the Nicaraguan people against their neighbors to the South. For the benefit of the Nicaraguan people, let’s hope Ortega is not able to distort the rules and get re-elected. Soy nicaraguense, conozco el area fronteriza de Rio San juan y Costa Rica, creo que ya es hora que Nicaragua reclame lo suyo, Costa rica se ha atribuido un area que no es de ellos, han contribuido a la destruccion de la fauna y la flora de Rio San Juan (areas virgenes), a treves de residuos industriales que contaminan las aguas de Rio san Juan, ojala que los que defienden la preservacion del medio ambiente, realicen investigaciones y contribuyan positivamente a salvar Rio San Juan, Nicaragua. Dear Maribel, on the world stage we must deal with facts (hopefully unbiased, impartial facts). In this discussion the facts are based on vetted historical documents and mutually accepted maps. Good intentions and aspirations of national grandeur such as yours can philosophically be healthy — in the right venues. However, comments without foundation of fact have marginalized you as a naive dreamer. No disrespect intended, I just want to give you a small bit of free advice: there’s no substitute for fairness, enlightenment, or in their absence, JUSTICE. El contibuir a la preservacion de los recursos naturales, del medio ambiente, no es cosa de debate de partidos politicos o ideologia , es deber de conciencia de nosotros los seres humanos, de conservar un mundo verde, respetando la naturaleza, su vegetacion y la fauna silvestre que nos da el entorno que nos rodea en este mundo en el cual vivimos. De acuerdo a la sentencia de la Corte Internacional de Justicia, los limites entre Nicaragua y Costa Rica estan determinados por los tratados Jerez – Caña, y los laudos Clevelan y Alexander, estos ultimos determinan los puntos limitrofes de la frontera, con coordenadas, claramente definidas si los ticos que se consideran civilista y amantes del derecho, por que no acatan estas disposiciones que datan desde hace mas de 150 años. Les digo a los ticos que no se dejen engañar por falsos nacionalismos. ya suficiente territorio le han cercenado a nicaragua. Si los ticos no reconocen los laudos Clevelan y Alexander, Nicaragua tambien puede desconocer el tratado Jerez – Caña y reclamar las provincias de nicoya y guanacast. Definitivamente todo está a favor de Costa Rica. Isla Calero es tica y punto. Absolutamente todos los mapas, excepto Google Earth por el momento, muestran claramente, sin punto de discusión, que la isla es costarricense. Incluso mapas oficiales de Nicaragua usados en la Corte Internacional de Justicia el año pasado muestran la isla del lado costarricense. Así que por favor se van retirando, ya de por si quedaron muy mal frente al mundo, como es posible que justifique invadir otro pais usando mapas de Google Earth??? Por Dios!!! Google Maps are very useful today to understand the geography of the area, especially as it changes. Not so good to establish the political boundaries. Had google maps existed back then we would not have this problem today. In any event this things is going to be solved marking the boundary (amojonando) on the ground, and that will solve the issue. Mr Bervis, you have bring to disc. the treaties and laudos up, but have you read them, have you see the maps, have you see a 1861 map, have you read the ICJ in regard of CR and Nic inssues, have you see the map broad for both contries to the Haya(both macth perf.) and then you may explaim me why Nic.’s maps dissapper from the official Inst of Nic, and why the map showed by Nic. in now days are diferent to all of actual maps and historical amps. Mr Bervis be honnest with yourself, first read and them talk with bases. 2) Admit that Alexander didn’t hand that peninsula to Nicaragua, but that there are other documents with more authority which do. What you can’t do is just ignore that map. It draws the border in a way that is beyond dispute. Also, please write in English, for the sake of the wider audience. Costa Ricans do respect the Cañas-Jerez Treaty of Limits, Cleveland Award, Alexander Award and the ICJ ruling from 2005. It looks like this whole mess is about how you interpret these documents, and why does Nicaragua now denies the legality of their geographical maps, the same ones that they presented to the ICJ complain and the same ones that were used at their schools and posted at the INETER (Nicaraguan Institute of Territorial Studies) web site, but now all of a sudden these maps are not legal any more neither available at their website. We are not the ones trying to change 150 years of history and treaties from one day to another. We are peaceful people but we are not afraid of defending what is ours with the means we have and I´m talking about diplomacy and dialogue. All we are asking, is for Nicaragua to remove the military from this area and also stop damaging the environment in this area. We agree that they have the right to dredge the river, just stop cutting the trees and dumping the soils on this area. Also, if Nicaragua is so worried about drug traffic, maybe we can get the UN or other organism to watch over the area while this gets resolved. This will not harm any of the countries, the problem is that this will not have the political effect that Ortega is looking for to win the next Nicaraguan elections. I would like to see our Nicaraguan friends stop repeating vain words and stick to the subject at hand here: the maps prove beyond a doubt the Costa Rican position. Also, this is not about Guanacaste, or the river, the first is ours and the later is theirs, period. You may talk about the treaties, sentences and accords in a way that never actually quotes what they say, but such documents are accompanied by maps which are reproduced here. If the search for truth is what attains us, they this blog post is the definitive analysis with only one conclusion possible. If you however are fond of repeating silly justifications for political (and electoral) purposes, they this whole circus that Ortega and Pastora have created, is the perfect playground. And it is a circus that repeats itself every a couple of years, did you know Nicaragua has taken all of its neighbors to the ICJ? Nicaraguan politians know the formula well, and their constituents always fall for it. Indeed Nicaragua has taken its neighbours and the USA to the ICJ, and it has actually gotten rulings in its favor, not that the USA agreed to obey the sentence, but that is life. When you are a weak society, that has not come together to achieve an institutional framework you become an easy prey for foreign powers. ICJ rulings are almost always Solomonical, both countries get something they wanted. So no country totally wins over another. Nicaragua is not a prey for foreign powers now, it is prey to the same characters as always: Ortega and Alemán. But all of that is another subject, what is your defense against the maps? This is the subject in question here, and NO ONE backing the Nicaraguan position has been able to produce any evidence in their favor, and that says everything. at this point i just want to thank the pleople who revised all the official documents and showed us the very truth. i am costa rican and i have never lived a disgusting experience like these before until know, i mean really feels bad knowing that your neighbor country is taking a part of your little but loved country, making a deal about something that they very well know and surely can cause more damage to their own people instead of the troublemakers because is very well known that this events may trigger a xenophobic feeling there in my homeland . i am hoping for a good and fair outcome to this problems. Very good the information. Is very necesary google remplace the bondary in the google earth navigator. They just did that. 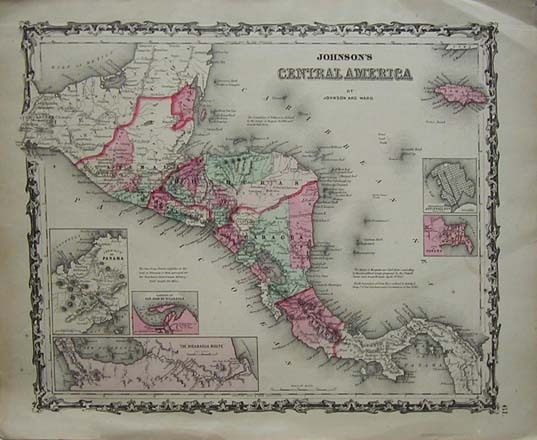 However now the new border does not match Costa Rica`s limits as shown on this site, and Nicaraguan territory is shown cut off from the rest of the country. I am sure google`s natural geography is correct, however borders cannot be that unstable. The current geography looks very different from Alexander`s map. Harbour Bay no longer is the natural terminus of Rio San Juan, and to be honest it is very difficult to tell what is the first channel that meets the river proper, the Caribbean? Let`s mark it on the ground and be done with this. Bad translation of the Alexander Report has been blamed as a source of confusion contributing to the conflict. There is a particular sentence that does not appear to make sense in plain English, much less in literal translation into Spanish. It is in the description of the initial line of the boundary: “Its direction shall be due northeast AND southwest, across the bank of sand”. Unless the AND in that sentence is interpreted as land surveying slang, or convention, I read it, in plain English, as telling me that a line that is supposed to run forward has two bearing (back and forth) simultaneously. If there is a land surveyor around, I will appreciate clarification. Thanks. A long-term plan by Venezuela, Iran, and Nicaragua to bring back to life a centuries-old plan to build a transoceanic canal in Nicaragua. …but for that, they need to grab that Costa Rican piece of land first! I’m a Ukrainian living in CR. I traveled to Nicaragua and have some basic understanding of life there. Although not a completely impratial outsider, my observation is it’s important to understand the vast cultural differences between the two countries, specifically between their governments and government policies. The armyless and historically peaceful Costa Rica is generally accustomed to play by the book, respect human rights and provide wide social guarantees to its people, including hundreds of thousands of Nicaraguan economic immigrants, vast numbers of whom are staying illegally in the country. Ortega and his entourage are ex-guerillas, warlords that have the corresponding aggressive take-it-all mentality, bullies by nature who don’t believe nor understand the notions of fairness, dialogue or justice, can’t go beyond their selfish clan mentality and really do not seem to care very much for the suffering of their own people. It is hard therefore to expect a level playing field with these people, and it’s naive to believe that what they say publicly has no self-serving hidden context or is not intended to deceive the “enemy”. It kind of seems to me that offering Ortega and his cronies the same conditions to present their case and treating their pronouncements as equally valid to CR’s claims is like giving tobacco companies floor to present their arguments that smoking is fine for you – “because we have to get both points of view”. Spot on! As I was telling some friends last week, the comparisons are really hard to make, because the Nicaraguan socio-political context is so different from that of Costa Rica, it is not like comparing apples to apples, not even apples to orange, but more like comparing a frying-pan to an apple. I traced, sentence by sentence, the description in the Alexander Report of the boundary line in the area in conflict, and annotated Alexander’s map identifying the locations where each sentence applies. I found that there is no room for misinterpretation. The boundary described by Alexander matches remarkably well the boundaries shown in the official maps of Nicaragua and Costa Rica. That boundary, is in fact the edge of water from the lagoon, to the harbor channel, to the river. In my opinion, there is no conflict. Alexander map shows that the configuration of the Harbor Head lagoon and its surroundings have not changed significantly in 110 years. 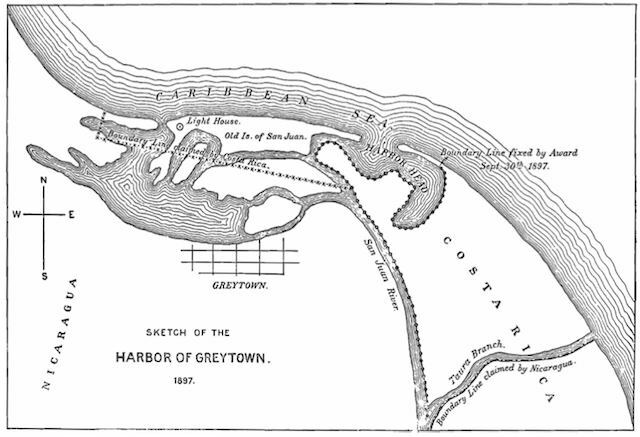 However, an older map from 1861 (http://bit.ly/acxRSU) shows that, at that time, the entrance to the harbor of Graytown (now San Juan del Norte) was significantly wider, and extending to the west. Currently, accretion on the west side has considerably reduced the width of the entrance. The irony is that instead of dredging westward to open the original outlet channel, they intend to dredge eastward, across swampy ground on Costa Rica’s land, and into a confined lagoon, creating in the process an unnecessary conflict. The fact that they are willfully ignoring the boundary line so carefully described by Alexander, together with their poor choice of the wrong layout for their dredging alignment, reinforce the perception that this may be an artificial conflict framed for political purposes. To me, the way out of the conflict, would be simply to acknowledge that there is no conflict. I wish I could attach the annotated sketch described above hoping that it could be posted in this blog and that it might contribute, in some measure, to defuse this artificial conflict. Problem is, Costa Rica is pretty much alone during this struggle. Ortega has the entire ALBA by his side, which will probably vote in favor of Nicaragua as failing to do so would be considered some sort of treachery. Maps, Awards and any other reasonable, rational arguments are no rival when it comes to Latin American lovely political alliances. And the US, well, as painful as it is to acknowledge, won’t take a stand unless there’s a specific interest at stake. A swamp in the middle of these two tiny countries hardly constitutes one. Up to this point (an OAS meeting is being broadcast right now), Nicaragua argues that this cannot be considered an invasion, as they are acting within their own boundaries. Their representatives won’t accept the categorical facts presented by Costa Rica, the very same facts you’ve read in this great post by Stefan Geens. Costa Rica, as an act of good faith (a little too naive, I must add), is asking for the withdrawal of all military forces before any further negotiations. The same recommendation was made by OAS Secretary Insulza, but Nicaragua has predictably chosen to do the opposite and strengthen their armed presence at the disputed territory. I’ll tell you, it’s enough to make you sick. That “naivety” is just doing the things following the channels, instances and procedures established by international law. CR doesn’t have the military means to respond to a threat like this. And I don’t think CR is so lonely and abandoned as you think, judging by the support of 22 countries at the OAS. The US? Give them time, they will help in a decisive and generous way once the timing to such move is right. CR is and has always been one very cherished country for the US. The 1861 map at http://bit.ly/acxRSU enlarges with great precision and shows the area in question beautifully. Everyone needs to look at it and it should be posted (region enlarged) on this site. This map, drawn right after the 1858 Cañas-Jerez Treaty, should end the dispute. The Laudos Cleveland and Alexander only reinforce what this map shows. I have only read the Laudos documents in Spanish but I presume they were originally written in English. Can anyone offer a site for the English original versions? I am not Costa Rican nor Nicaraguan and have no nationalistic interest in this dispute. I have found both the Nicaraguans and Costa Ricans to be wonderful people. We should all look beyond political posturing and rhetoric. The issue of constructing a canal in this region, connecting both oceans, has been in consideration literally for hundreds of years. This path through the San Juan River very strongly vied with the Panama Canal path in the late 19th century and it was by some chicanery and a good price from the French that the Panama Canal route was eventually chosen by the US. Though the US appears fairly quiet now I’m certain it is studying the problems intensely and sees no rush to intervene. Though I’m all for preserving the ecology of the region it appears inevitable that another canal will be built along the San Juan River and it could be of great monetary value to both countries and the world. Whether there is only modest navigation and eco-tourism improvement in the area or a mega project for international shipping, both nations must work together peacefully and cooperatively. A gradual, peaceful and well thought out approach with lots of international collaboration, I believe would be the best course for all. No saber rattling please. The OAS is lending its support to a friendly resolution. José, I have seen that map and while it does look compelling, the versions of it I have seen online also appears doctored — look at the area of Nicaragua in the top right region, there is even a part where a longitude line has been wiped to erase what I presume is text. I don’t know why this map has been doctored, and so prefer not to use it in my blog post. As for English language versions of the laudos (awards), they are linked to from my post. Even without the mentioned supposed “Primer caño segun Alexander” (where is the original data/text? ), the first “caño” is exactly what Nicaragua says and where they seem to want short-cutting San Juan river. No, obviously both Cleveland and Alexander wrote and published the original in English, as Americans in the 19th century. The Spanish version is the translation. “Caño” means river course, and Alexander’s maps do not show a river course along Nicaragua’s new claim line. To me, Alexander’s text is not confusing, and corresponds to the border he drew on his map (which was his intention). Great blog on the details of the border dispute. I’ll refer to this page when I post on news comments. Thanks Stefan for pointing out the links and for the objective work you’re doing here. I do notice on the 1861 map where areas appear erased including the longitude line. Very observant of you. I’m not sure how that impacts the actual location of the river and the area in question. It would be good to know the provenance of the map and who owns it now. I’m looking into it. Can’t find the basis for the Nicaraguan claims either and often conflicting with the original texts they say to rely on. Then tonight Ortega showed another map on TV; now that earlier claimed northern piece is in neutral yellow and he only mentioning that his troops stay at Harbour Head above the earlier claimed territory. So he pulled back (maybe not all his troops yet). Used some words to camouflage his moves from his people. Had the Cardinal blessing him as common since a year “Cristiano y Socialista” and were singing religious at the end (how to win the elections in a year for a unconstitutional 3rd term) . Said he would leave OAS as Nicaragua was embarrassed by them and that he and his friend Chavez had a phone conversation and were disappointed. That Nicaragua would go forward to claim the right to navigate on the river Colorado as this comes from Nicaragua, just at the same conditions as Costa Rica has for San Juan. To me it seems like bargaining; they really want/need that piece (for a harbour, ‘Panama’ canal or so), trying to create a situation that Costa Rica needs to negotiate so they can get that little but important piece. Actually I think Nicaragua is right; a quick look on the map suggest that it geographically belongs to them, as it did before. But not based on these treaties, except for old borders before a war. What seems to have been a colonial war for a Panama canal too of some imperialist Gringo. Therefore they might think why should Nicaragua pay the price for these changed borders? Same for Bolivia making claims for their right of an entrance to the sea; ‘burn the treaty’. The dragging is financed by Venezuela and equipment build by a Russian engineer who lives in Nicaragua. Back to the maps: I partial agree with the Nicaraguan point of view that a map made by the same Alexander 39 years later, is no proof at all that this was his original explanation. Still missing some original texts… Like Cleveland in English and some original points of reference made by Alexander. Ortega and Pastora also mention this map so now and then on TV; next to that Costa Rica took the province of Guanacaste and Nicoya, they took a lot of land towards the river San Juan “de Nicaragua”, what is causing the present problem. Not any inch of Nicaraguan territory ever again, they shout; also referring to the sea border dispute where Honduras, Costa Rica and Colombia have joined against Nicaraguan territory. That harbor map (from 1878?) is a nice find, but it does not show a river channel where Nicaragua now wants to redraw the border (on this map, the Nicaraguan claim line would extend from the extreme right-hand side of the map, downwards). Both this map and with E.P. Alexander’s map seem to place two islands at the mouth of the river near Greytown, creating several channels, and Alexander says to draw the border along the first channel, as he does on his map. Stefan, I understand that the map draw by Alexander (the second in this post) is part of the original prize. If that’s so, why Mark mentions some map draw 39 years before? Just as does not matter if Costa Rica took land of Nicaragua in the 1820’s (what, by the way, it’s not the case). Related to the questions examined here and the issue of good will to have some resolution, I wish to mention that last night I listened to a Costa Rica Channel 7 live interview with Nicaragua’s Gen. Edén Pastora and two Costa Rica authorities on the border dispute. What a nasty and conniving brute is this Gen. Pastora. Nicaragua should be embarrassed to have him as a spokesman for anything. He just continuously levels personal insults and attacks as if he were engaging in some jungle warfare. He calls the people he’s debating outright liars as he pushes sloppy interpretations of treaties and contradictory statements about what he himself has stated. He makes it clear that his approach is simply to bamboozle his way through a discussion. What a difference between his approach and that of the Nicaraguan ambassador to the OAS who was reasoned and polite. Pres. Ortega’s manners and tactics are not much better as he outright accuses governments of being essentially run by drug dealers and concocts a map of the disputed region with no resemblance of that described in the Cañas-Jerez Treaty, the Laudos Cleveland and Alexander or any existing official map, including those of his own country. Looks like barefaced aggression and a desperate effort to hoodwink his constituency for political ends. Those nasty tactics are, on the world view, only counterproductive to the Nicaraguan case as people are more educated these days and see through the huff and puff, loud barking that attempts to smother reason and the facts. If they wish to build a canal or improve access to the San Juan River they are definitely going about it the wrong way. I find this article and most of its comments to be very biased against Nicaragua. Gratuitous insults to Ortega and Nicaragua add nothing positive to the discussion. Ortega’s presidential aspirations are irrelevant, but just remember that it wasn’t that long ago that the Costa Rican Constitutional Court annulled a 1969 constitutional reform which had barred presidents from running for reelection. As a result, the law reverted back to the 1949 Constitution, which permits ex-presidents to run for reelection. It’s Nicaragua’s business and has nothing to do with this. The real reason right-winger Chinchilla has made this into an “international incident” is that she would like to stop Nicaragua from competing for the tourism that Ticos and their foreign investors think belongs to them, but which has been going more and more to Nicaragua. I saw the military personnel CR sent to the border from photos published in Tico newspapers. To keep saying CR “has no army” is absurd. It is trained and equipped by the US and Israeli military – better than the Nicaraguan army. Those “police” in military fatigues, carrying machines guns and M16s – all to confront a dredging boat. Costa Rica is the provocateur here. Why don’t those “police” do a better job of stopping the flow of drug traffic coming from Costa Rica? It’s Costa Rica that just sent in more troops, while claiming they want a peaceful solution. Throwing in rumors and half-truths about Hugo Chavez, ALBA, etc. is a red herring, a distraction, irrelevant. Why don’t you also mention how much Costa Rica receives from the US and other donors in the US camp? Or that the US gave Israel $1.6 BILLION last year. Costa Rica has received more than $1.1 BILLION from the US. All irrelevant to this border “dispute”, but you want to smear a country for who it recieves aid from, think about what the US “aid” buys from Costa Rica. In the past, it bought bases from which the Contra mercenaries (including the loudmouth Eden Pastora, who became a Contra himself) could attack Nicaragua. Costa Ricans seem to have conveniently forgotten about that. It’s hypocritacal to claim the Costa Rica is peaceful, and Nicaragua isn’t, when Costa Rica has willingly participated in the war by proxy against Nicaragua. It looks like the US and CR are priming the public for another proxy war against Nicaragua. As for environmental damage, Costa Rica recently dredged the Colorado to enhance river tourism there – but apparently when they do it, it isn’t environmental damage. Granada, I can’t of course speak for other commenters and their eventual biases, but where in the article do you find bias? I made a point of not using tendentious speech, getting sidelined by emotional appeals or speculating about motive. Is there anything about the facts or analysis you dispute? Dredge whatever you want in your river, but don’t throw your garbage in our land and destroy our forests. Drugs? If you claim to be so good at stopping drugs, stop them 1 km north, why do you have to be in Calero to do that? Stefan, I’ve been looking at the varied relevant maps very carefully but have some difficulty understanding how ships actually enter the bay. It looks as if the Alexander and Google maps have an opening from the ocean into Harbor Head but the Costa Rican, Nicaraguan and other maps including the 1861 map appear to have a strip of land blocking direct entry. Would you explain where ships would actually enter the harbor and then move on to the San Juan River? I must be missing something. This blog deals on how Google influence society, right? So, here is my question: how can we explain that Google did have the Nicaraguan interpretation of the border or the other way around? Did in fact Nicaragua look at Google´s mistake to reevaluate its border interpretation, or actually, Google sources (some US agency) granted that piece of land to Nicaragua rightfully? Any how, I think Google should take the bullet, a multibillion dollar company and cannot verify extensively a few international borders from more than one source, and then just decide to change it without any strong statement with the reasons for that change. Corporate Responsibility I would call it. Maybe they can pay for the Ecological impact studies, the cleaning of the river, plant some trees, the fees for the process on the International Court of Law, etc. David… how can you say “without any strong statement with the reasons for that change”?? Isn’t enough the maps on the original awards by U.S. president Grover Cleveland, and E.P. Alexander enough? Have you seen the overwhelming evidence exposed in this post? “Any strong statement”? Dude, cool down. I said, I have issues with Google not giving enough details on the reasons for the change. It will be up to the ICJ to determine the limits now and determine who was right or wrong. This is all (and for me it isn´t strong nor very informative on the policies of the company on this regards) the statement they released to the best of my knowledge. Last week, we were informed of a data error regarding the border between Costa Rica and Nicaragua in Google Maps. We said we would update our data for this region. We have now updated the border data on Google Earth, and we are working on updating this border on Google Maps as well. As always, you can report errors about Google Earth through our Data Reporting Page or about Maps through the Report a Problem tool, where available. That’s a very interesting question David. What exactly is Google using to determine borders and how does it justify easily switching border lines? Maybe they have explained that somewhere. Pingback: Where On Google Earth? You are right Marco that this post brings out maps and evidence that are compelling but I think David’s comment is that Google itself has not declared what have been its sources for changing the map. Has Google stated what is its rationalization for the border change that now conforms with the evidence given in this post and not with the Nicaragua claim? And where did it get the idea for its original error? Still not having seen here the original texts of Cleveland and Alexander in English, that Nicaragua says proofs their point. 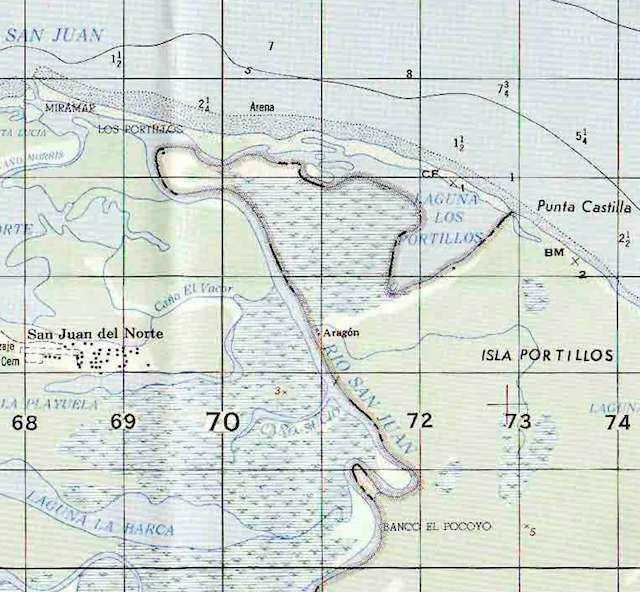 One should be aware of two different points of Castillo, or maybe even three… The 1861 map shows Castillo on top of island Portillo (as Nicaragua names the disputed land and argues that this is not isla Calero of Costa Rica). 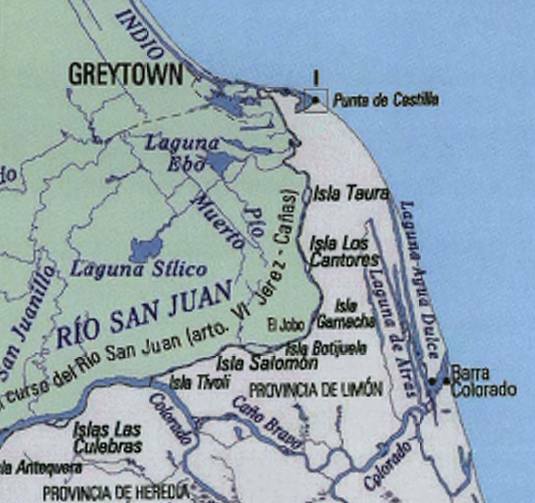 There seems to have been a old Catillo(=castle) and Cleveland in Spanish talk about the punto Castillo to the first river to river San Juan following the ruins of the old castle. Maybe I should go there myself to take pictures and videos from where the ruins of an old castle are? Or does anyone have data about the location of the castle and ruins? And pity that some wikipedia links failed for moderation; these migt be a bit side-topic, but shows that the war and treaties that led to the present map had all to do with imperialism for a ‘Panama’ canal right there. Thereafter the situation might be made for the same imperialist reasons differently in order to avoid a new ‘Panama’ canal that conflicts interests of profits and investments of Panama, USA and Canada. Same for that some huge western consortium of builders want the orders for up to 20 billion dollar, while Nicaragua now is on its path to do it themselves with help from Venezuela for one fifth of the price others calculate. Costa Rica went to the International Court in The Hague to claim ecological damage by the dragging, what is an immediate result of these treaties and makes a new inter-ocean canal there almost impossible without permission of Costa Rica and their allies. Why don’t you follow the link to the original English texts in my blog post. They are clear enough to me. Thanks for the information in this post. I think it is not partial but the objectivity of the maps and the actual documents make it look that way. I agree that this issue is probably going to need external entities to come to a conclusion since both countries use or are used to very different approaches to international, and even local, conflicts. It is worrisome to see how the media can have such a big impact in peoples, and how it is used to distract and even incite to hate and violence. There are several things to have in mind when a conflict like this one starts. I would not say that to think about possible motives behind it is a bad approach to the media, it does not mean to assume anything, but to have a critical or analytical view of the matter so to not be a naive or passive listener to what the news have to say. In this case it is necessary to look at data, and thanks to this blog, it can be said that the documents talk for themselves. Now, with respect to attributing the fact that Costa Rica´s president has brought this issue to international knowledge, I think it is obvious that if there is a violation to the sovereignty of a country, that country will appeal to the diplomatic entities as it corresponds. I have been to both countries and I can say that not only Costa Rica´s infrastructure and services are more appealing to tourism but the political stability of it, and in that sense I believe that if Nicaragua were interested in investing towards increasing tourism it would not engage in international disputes as often as it does (to mention another dispute we can see San Andres land dispute with Colombia). It is not reasonable to believe that Costa Rica´s appeal to international help lies in its touristic competition, if it were so it would be probably trying to harm Panama´s reputation and that is not the case (noting that Panama´s economy has been growing continuously and steadily and is the second richest country in Central America). The fact of the matter is that it is sad to see the poorest country in Central America waste energy and means in a nonsensical dispute when it could be increasing the opportunities, education, and life standards of its inhabitants, and sadly these inhabitants still believe in those who have the power. This guy basically went to the original source: Costa Rica’s copy of Alexander’s treaty (the other two, Nicaragua’s and US should be exactly the same). The video goes over the relevant parts of the document, the map that was provided and the process by which many precise points of the border were determined at the time. I think Nicaraguans are arguing that the last document where the map is located is not valid because the signature of the Nicaraguan representative is not present. Nevertheless, Alexander’s signature is there, and in the Matus – Pacheco agreement it says that in the event that some representation of one government is not present, they agree to whatever the USA’s representative decides, without possibility to disagree later on. The explanation is here http://actasalexander.blogspot.com/2010/11/las-pruebas-me-remito.html (again, sorry because it is in Spanish).